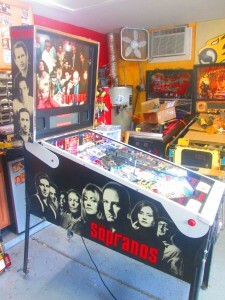 We just finished a full shop job on this Sopranos pinball machine. This one got some extra-special touches, and it turned out even better than we expected. Check it out! 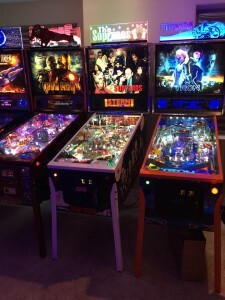 Here’s the machine in its new home, with some fantastic new neighbors! The white powdercoating and the topper put this pin over the top. Here’s the game while still in our shop. We didn’t put on the final pieces until it got to its new home because we didn’t want to risk any scratches. Stern came out with The Sopranos in 2005, two years before the hit TV show ended its amazing run. 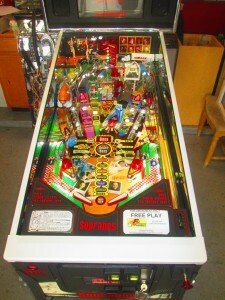 We gave this game a full shop job, tearing everything off the playfield and polishing, washing, tumbling or otherwise cleaning it. 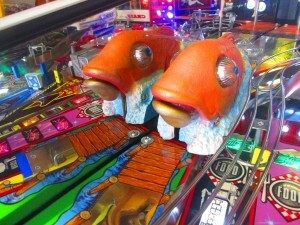 In addition to the powdercoating, we gave this game some other great touches, including these mirror blades. The blades look especially great on games that aren’t stacked too high on the sides. 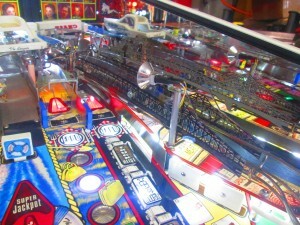 We gave the game the full LED treatment, too: Inserts, GIs, and flashers all were changed out. Enjoy the game, Greg! 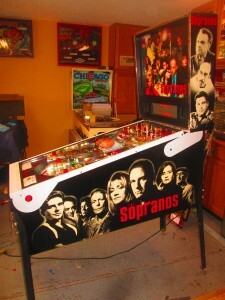 Bada bing!